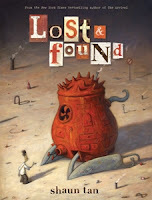 I have finally read some Shaun Tan, and I do like his work. 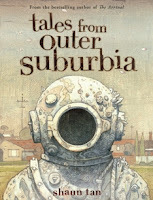 Tales From Outer Suburbia, in particular, reminded me of the Ray Bradbury short stories I read in my early teen years. My uncle Mickey, a college graduate who married into the Gauthier family, had an enormous trunk filled with paperback books. Once when my parents, sisters, and I were visiting him and my aunt in the old house their were living in up in the mountains, he opened that treasure chest and pulled out a couple of Bradbury books to give me. They, along with To Kill a Mockingbird, were among the first adult books I read. My recollection of the Bradbury short stories, and his book Dandelion Wine, a particular favorite of young Gail's, is that they were small town stories about things that just weren't quite every day. And that's how I read Tales From Outer Suburbia and Lost & Found, too, though in this day the action shifts to suburban towns rather than whatever small towns used to be back when Bradbury was writing. Tan tells his tales in part with visuals, making his books picture books and seemingly for the very young. I see them more for older readers, older children, as I was when I first read Ray Bradbury, and adults. Check out Shaun Tan's essay PICTURE BOOKS: Who Are They For?, in which he addresses the question "Who do you write and illustrate for?" Among the things he has to say while trying to come up with an answer: "I suspect that much art in any medium is produced without a primary concern for how it will be received, or by whom. It often doesn’t set out to appeal to a predefined audience but rather build one for itself. The artists’ responsibility lies first and foremost with the work itself, trusting that it will invite the attention of others by the force of its conviction." He also says, "What makes art and literature so interesting is that it presents us with unusual things that encourage us to ask questions about what we already know. It’s about returning us, especially we older readers, to a state of unfamiliarity, offering an opportunity to rediscover some new insight through things we don’t quite recognise (as it was for all of us in the very beginning)." I think that's a very good explanation for why adults like picture books, in general, and Tan's books, in particular. The strangeness of both Tales From Outer Suburbia and Lost & Found do make the familiar unfamiliar, much as Ray Bradbury's short stories did years ago.